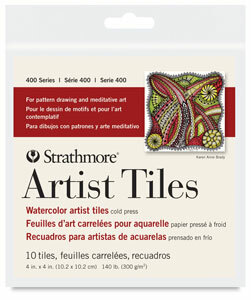 Ideal for pattern drawing and meditative art, these affordable, pre-cut artist Strathmore 400 Series Watercolor Paper Artist Tile sheets help make the process of combining repetitive marks, circles, lines, and forms both fun and easy to learn. This heavyweight, cold press, acid-free paper is great for all wet media and finished artwork. 140 lb (300 gsm). Watercolor Artist Tile, 4" x 4"